The typical bathroom is already so starved for space, it can be like a jigsaw puzzle trying to fit everything in. Large pieces such as the toilet, shelving, and bathroom vanity crowd into this tiny area, with every square inch at a premium. And the one element that takes up the most space is the bathtub or bathtub/shower combination. A standard-sized bathtub displaces over 13 square feet of floor space. A comparable corner shower stall unit occupies about 30 percent less room (9 square feet). Because bathrooms do tend to be small, space planning is of utmost importance. Larger rooms or rooms that have fewer services than bathrooms have greater leeway when positioning fixtures and movable elements. But homeowners and designers working out bathroom plans often find themselves nudging items by inches rather than by feet in order to get things just right. Knowing standard bathtub sizes is the first step toward smart, effective bathroom planning. A bathroom alcove is a space bounded by three walls. In narrow bathrooms, a typical configuration is to situate the alcove width-wise, so that the two long walls of the room form the ends and the back wall forms one side. In other words, walls naturally form the alcove. However, in larger bathrooms, not all of the walls are close enough to create the alcove. This means that the alcove might be situated length-wise in the room, with a non load-bearing wall built specially to form one end of the alcove. Millions of bathrooms are outfitted with this standard-sized bathtub. Most alcoves are sized correctly for this bathtub, which means that this tub is your only option for a retrofit. The only alternative would be to move the walls that form the boundary of this bathtub. This popular segment of the alcove tub market adds an extra foot to the length and several inches to the width. This supersizing of the tub will accommodate larger sized bathers or two people. Or it is the perfect bathtub for those who simply want more room. This long bathtub will not fit in most alcoves. It is a good option for new construction projects or for remodels that involve moving a wall for added space. Oval bathtubs come in either the drop-in or stand-alone variety. Even though oval tubs appear to be more generously sized in all directions, in reality, they are only wider, not longer. 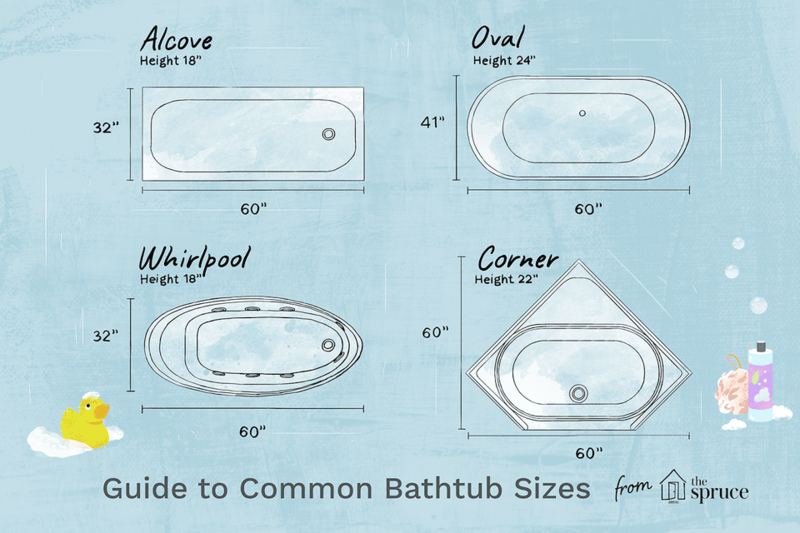 Comparing a standard-size oval bathtub with a similarly sized alcove tub (60 inches), the oval proves to be up to six inches wider. For the drop-in variety of oval tubs, this means that you must build a wider apron for the tub to rest in. Even though whirlpool bathtubs might visually appear to be larger than normal, in many cases these tubs come in standard alcove-ready sizes. The reason is that more regular size bathtubs are being outfitted with whirlpool mechanisms than in the past. The thin acrylic shell provides ample interior space for hiding the tubes for the jets and the pump unit. Six-foot rectangular sizes are available, as well as high-sided whirlpool walk-in tubs. Corner bathtubs are a great option for a master bathroom, especially when you love nothing more than lounging in a tub with a good book or streaming show. Corner bathtubs are more about luxury, fun, and treating yourself well than about getting clean. For placement, it helps to think of corner bathtubs as square-shaped, not triangle-shaped. Essentially, a corner tub is a square with one corner ​snipped off. That missing corner barely gives you any more floor space. It is just a way to give the tub this distinctive shape and to smooth off a potential bumping point. Most standard-sized corner bathtubs can fit in alcoves.